WaPo's Karen DeYoung just broke the story on the resignation of Foreign Service Officer and former Marine Captain, Matthew Hoh, over the war in Afghanistan. According to his LinkedIn profile, Matthew Hoh joined the Foreign Service in March 2009 as a Political Officer. He previously served as a Combat Engineer Company Commander for the US Marine Corps Reserve (March 2006 — June 2007), worked briefly in the Iraq Policy and Operations Group at Bearing Point, was Regional Programs Coordinator for the US Department of the Army (May 2004 — June 2005) and served as Action Officer and Writer at the Office of the Secretary of the Navy, US Marine Corps from November 2002 — April 2004. He graduated from Tufts University in 1995. 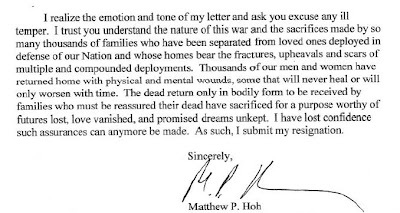 Read Matthew Hoh’s Resignation Letter (PDF). Somebody has already posted his resignation letter in Scribd, so I'm embedding it below. This only matters to be because of the whole debacle about FSO reaction to the possibility of directed assignments to Iraq, but it is my understanding that he was not an FSO per se. He was hired directly for that position. He did not go through A-100 or mustang in.